Santa Monica is a coastal city in western Los Angeles County, California, USA. Situated on Santa Monica Bay of the Pacific Ocean, it is surrounded by the City of Los Angeles – Pacific Palisades and Brentwood on the North, West Los Angeles and Mar Vista on the East, and Venice on the South. It’s easy to see why Santa Monica is considered the first choice for a Southern California beach vacation. This seaside city blends the charm and appeal of a coastal getaway with an unforgettable beach and the sophistication of an urban center-a magnetic combination. 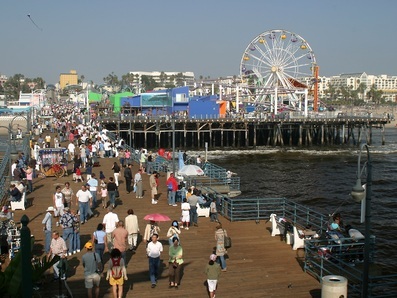 Known for its healthy lifestyle, Santa Monica is situated in a compact, walkable 8.3 square miles. This environment- and pedestrian-friendly city also boasts one of the most respected public transportation systems in the nation, making the entire city easily accessible and convenient, even without a vehicle. Additionally, the city’s world-famous beach and bike trail offer a vast assortment of outdoor recreation and activities. Santa Monica College (SMC, locally known as “Pico Tech,” “Harvard-by-the-Sea” or “UC Santa Monica” (needs citation)) is a junior college founded in 1929. Many SMC graduates transfer to the University of California system. It occupies 35 acres (14 hectares) and enrolls 30,000 students annually. The Frederick S. Pardee RAND Graduate School, associated with the RAND Corporation, is the U.S.’s largest producer of public policy Ph.D.s. Universities and colleges within a 15-mile radius from Santa Monica include Los Angeles City College, Los Angeles Southwest College, Los Angeles Valley College, Loyola Marymount University, Pepperdine University, UCLA, USC, West Los Angeles College and West Valley Occupational Center.